Instant Pot Shredded Chicken is a delicious and fast way to prepare chicken breasts! 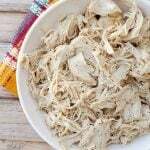 If you have been wondering how to make shredded chicken in your Instant Pot, then this is the perfect recipe for you! Pour chicken broth down the side of the pot so you don't rinse off all the spices on the chicken. Put on the lid and turn to seal. Set manual or high pressure to 15 minutes. Store chicken in the refrigerator in an airtight container and use as needed, up to 4 days. Most Instant Pot recipes call for at least 1 cup of liquid. Only 1/2 a cup of necessary in this recipe. It is enough to come to pressure since the chicken released liquid. Most meats are best when using a natural release, but with chicken, quick release works fine. Nutritional values are for 3 pounds of chicken only which should yield between 6-7 cups. The actual amount may vary depending on the size of the chicken breasts.